IArmor 6.5 Nerf Bars Square Tube Fit 01-07 Chevy Silverado/GMC Sierra Crew Cab. IArmor, by APS is a new generation of running boards designed to look and feel different. 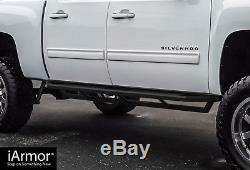 Most running boards in the market are round or oval. 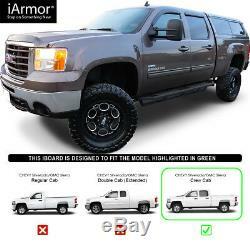 IArmor's flat profile design is clean and modern - giving your truck a truly distinct look. The iArmor's low profile design is so unique even your dealer will be asking you where you got them from. The iArmor's aircraft grade aluminum and heavy duty brackets can support up to 300 lbs without bending. 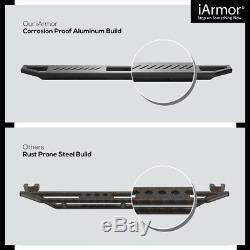 The iArmor is sturdy, comfortable, and durable. Its ridged rubber top provides a solid, non slip and continuous footing along the entire length of the bar. Which means these running boards will give you unparalleled access to your truck's windshield, roof top and truck bed. Most DIYers will find the iArmor incredibly easy to install. Even people who aren't otherwise mechanically inclined have installed these running boards in under an hour. 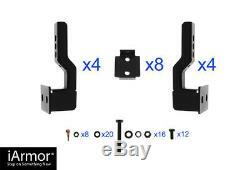 Installation instructions, brackets, and all the required hardware are included in your package. Don't hold back from installing these yourself. Cleaning them is even easier, just give them a good wash with the garden hose and they will look good as new. This sure beats having to spray or oil down stainless steel running boards that require delicate non abrasive cleaners. The proof is in the pudding, read our many 5 star reviews to see for yourself. DUAL FUNCTION - Set of 2 running boards with heavy duty 6.5 inch tread plates. 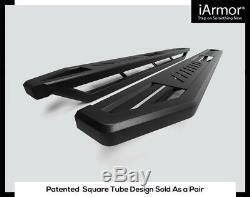 The iArmor acts both as comfortable side steps, and protective rock sliders. PROPRIETARY DESIGN - Our USA patented design features square tubing + slanted tread plates. Get that agressive off-road look! BETTER MPG - Compared to steel nerf bars, the iArmor's 100% aluminum construction & carefully engineered dual girder system keep your truck better protected and more fuel efficient. HEAVY DUTY - Supports up to 500 lbs in weight capacity; iArmor running boards are black powder coated for rust resistance and UV protection. DIY READY- Bolt on installation; All hardware, brackets & instructions are included with running boards. 6.5 inch Wide Square Tube Rocker Guards. Aluminum (Nerf Bars) + Steel (Brackets). Matte Black Powder Coated Finish. Rocker Panel Mount (Drilling Required). This is also the safest way for you. Find a lower grille price? We will match or beat ANY competitor's price on same quality. Mesh Grille-SS 1.8mm Black. Symbolic Grille-Mesh SS 1.8mm. The item "IArmor 6.5 Nerf Bars Square Tube Fit 01-07 Chevy Silverado/GMC Sierra Crew Cab" is in sale since Friday, September 22, 2017. 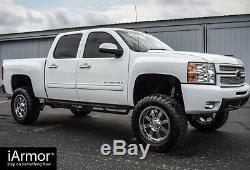 This item is in the category "eBay Motors\Parts & Accessories\Car & Truck Parts\Exterior\Nerf Bars & Running Boards". The seller is "automaxstyling" and is located in Ontario, California. This item can be shipped to United States, Canada.